Seen from the air, the five lakes that form the Garden Route Lakes District appear as a shimmering string of irregular blue glass running parallel with the Indian Ocean. They were created over time, by a natural damming of water in the valleys between two dune ridges, one 300,000 years old and the other a much more recent age(in geological time) of 6000 years old. The valley was reshaped by erosion and upheaval until only the deepest basins retained water and the formation of the Garden Route Lakes emerged that exists today. These Garden Route lakes provide recreation and sustenance to man and beast whilst enhancing the natural beauty of this already scenic landscape. 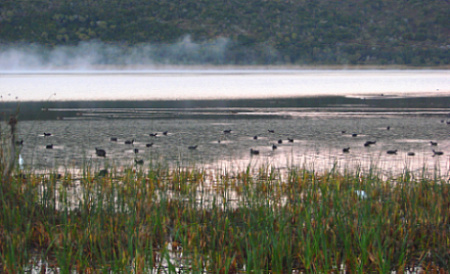 Situated between George and Knysna in the Western Cape, the Lakes form an important wetland for several species of waterbird during the winter months as conditions deteriorate at the inland wetlands where they breed. Wilderness Lakes was designated a Ramsar Site 28 June 1991 which means that these lakes are acknowledged as being a wetland area of value and worth protection according to the Ramsar Convention Treaty. It doesn't mean however, that they have been granted conservation status so they are vulnerable to human activities such as farming, forestry and recreational pursuits. 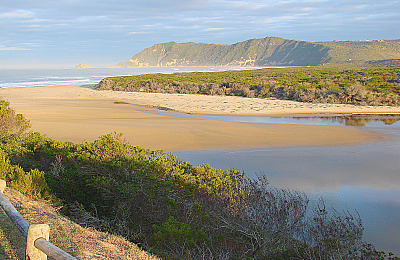 One of only a few warm temperate coastal lake systems in southern Africa, it is fringed by coastal fynbos and evergreen forests and uniquely connects to the marine system. It comprises a lagoon and the flood plain of the Touws River, linked by a natural channel called the Serpentine to the three lakes Elandsvlei, Langvlei and Rondevlei, and the nearby Swartvlei system. This intergovernmental treaty was adopted on 2 February 1971 in the Iranian city of Ramsar, on the southern shore of the Caspian Sea. Nowadays it is written as "Convention on Wetlands (Ramsar, Iran, 1971)", but it has come to be known popularly as the "Ramsar Convention"
It is further noted in the same article, “Global freshwater consumption rose sixfold between 1900 and 1995 – more than double the rate of population growth. One third of the world's population today lives in countries already experiencing moderate to high water stress. By 2025, two out of every three people on Earth may well face life in water stressed conditions." In this part of the world we well understand this because since the floods in Nov 2007, the pendulum has swung the other way and we experienced unseasonally low rainfall in 2008-2009 until the summer of 2010 when the monthly rainfall figures improved somewhat. However, the towns of the region suffered stringent water restrictions. Posters advertised that we were a water stressed area! Sedgefield's water usage was monitored on a daily basis and the results published on billboards around the town. At one time water bowsers were carting water to our municipal reservoir. Pipes were then installed from Hoogekraal River to supplement the water in the Karatara River from where we normally drew our water because the river had stopped flowing. In Nov 2009, a desalination plant was installed on Myoli Beach. We were the pilot project and the first town in South Africa to get a desalination plant! Other towns, larger than ours such as Knysna and George were also suffering, with reason to be even more concerned because they had larger populations. 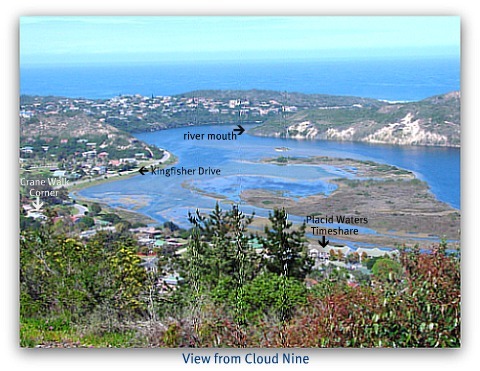 So the Garden Route Lakes form a dynamic wetland system that is being affected by the human demands placed on rivers that feed them and face exploitation like almost all wetlands around the world. 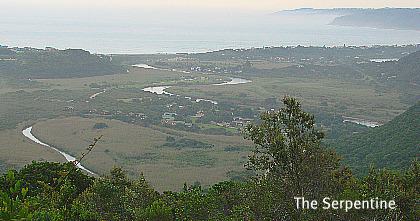 Covering an area of just over 3 square kms on the outer eastern end, Groenvlei is the most unique of the Garden Route Lakes. It is the only fresh water lake with no recognisable inlet or outlet. Water seeps up from subterranean channels and is slightly saline. Depending on rainfall and evaporation, the levels can fluctuate by nearly 2 metres. The clear water is coloured aquamarine by the reflection of sunlight on green algae against the calcium rich white lake floor and the greenery around the lake. The clear waters are pleasant to swim in but difficult to access except at the few boat jetties and from the lawn near the caravan park as the banks are heavily reeded with fen grass. In centuries past, browsing hippos in particular and thirsty wild life like elephant, buffalo, eland and bushbuck trampled the grasses when coming to drink. Since these animals no longer roam freely in the area, (except for bushbuck) these reeds seem to be gradually encroaching on the lake. 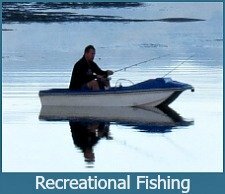 Anglers generally fish from small boats, to catch Black Bass, Mozambique Tilapia and Carp. Regrettably, these species were introduced before the long term consequences of this action could be understood. Sunfish were introduced to feed the Bass and Mosquito fish to eat the mosquito larvae. These imported fish have the potential to destroy the vlei's ecosystem and have jeopardized the relic estuarine White Bait and Brown Herring that became a freshwater species after surviving the natural closing of the lake to the sea thousands of years ago. 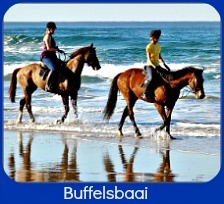 Lake Pleasant Holiday Resort has chalets and well laid out shaded campsites on the shores of Groenvlei. 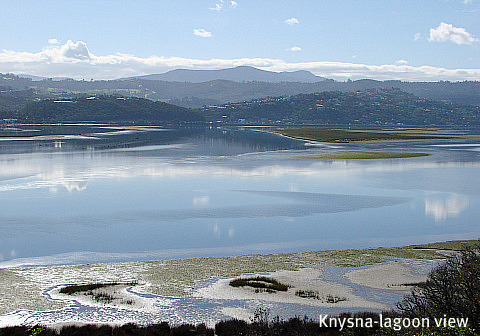 Unlike the other Garden Route Lakes, Swartvlei embraces a lake, lagoon and estuary. It is clearly divided into a fresh water section in its upper region and a salt water section in the estuarine area influenced by tidal influx. 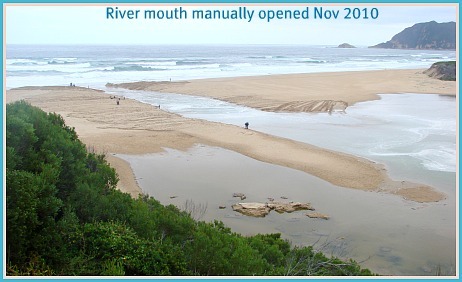 For the most part it is left for nature to dictate the opening and closing of the Swartvlei river mouth. However, because of human settlement on the fringes of the estuary it becomes necessary for manual intervention from time to time. When floods threaten from high volumes of rainfall in a short period of time. e.g. 2003, 2006, 2007. Towards the end of 2010 regular rainfall had swelled the water volume in the lagoon but not sufficiently to force the mouth open. 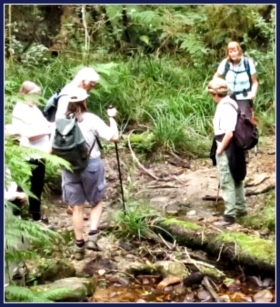 Salt water from the estuarine section was pushing back up the Karatara River and contaminating the fresh water with a high saline content up to the point where Sedgefield drew its water. Concern over oil pollution from the wreck of the Kiani Satu in August 2013. 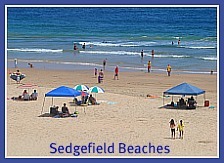 Because Sedgefield is virtually surrounded by water, boats are popular and all kinds are used. Motorboats are restricted to certain waterways to protect vulnerable areas. Paddle boats are available at the timeshares. Canoes are undoubtedly the most prolific water transport for enjoyable exercise or you can spend hours meandering along the tranquil waters of the lagoon. You can swim, fish, (catch and release is advocated) bird - observe intimate moments of a moorhen with her chicks, or surprise the Black Crake striding among the sedge grass. The estuary is a nursery for many sea-going fish and hundreds are seen swimming in the shallows seeking protection among the grasses at the water’s edge. 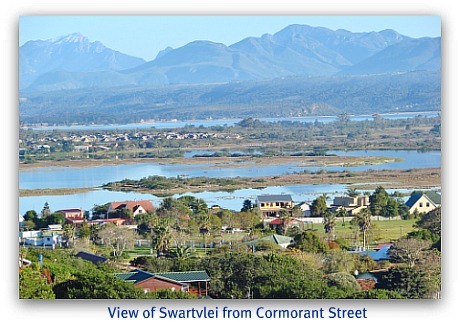 Swartvlei’s history reveals a drowned river valley created 16000-45000 years ago by the merging of three rivers the Hôekraal, Wolwe and Karatara. The waters gradually receded to a lake in the deepest depression. It is darkened by the humic forest vegetation through which her rivers flow. 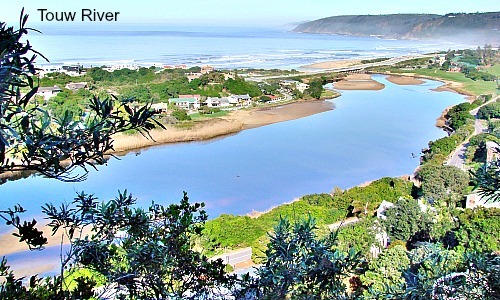 The rivers are a fundamental element of the Garden Route Lakes system that are vital to to the well-being of the Swartvlei. This aptly described "womb shaped mother lake" has her feeding rivers as the fallopian tubes and the estuary, opening to the sea is the birth canal. 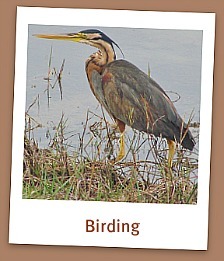 It is the largest lake – 14 square kms - of the Wilderness wetland area. In a tidal phase a mouth broke through the dunes giving the lake access to the sea at Sedgefield. 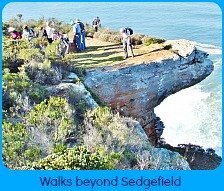 To begin with the river flowed more directly into the sea at the place known as Swartvlei beach but over thousands of years erosion and wind caused the more meandering route into the ocean where it it is today. 4000 years ago, sea level was the same as it is now but during the formation of the estuary about 16000 years ago the level was 120m lower and so now there still exists a range of submerged dunes under the sea along our coastline. Unfortunately, of the Garden Route Lakes, the Swartvlei has suffered the most human interference. The national highway bridge and the railway bridge in particular, constructed over it, have effectively reduced the flow of the river causing the lagoon to silt up. Changing ocean currents and reduced river flow causes a sandbar to form at the mouth in drier months closing it off from the sea. Ill-advised property development on the natural flood plain is threatened in times of flooding. Property owners want the mouth to be breached artificially when closed. This prevents the proper build up of water that allows natural breaching to forcefully scour out the silted up areas. The high human population and easy access is adding to Swartvlei’s pollution in the form of abandoned fishing tackle and careless dropping of refuse and there is little control over its recreational uses or monitoring of the lake’s fish resources. Farming along the rivers also compound the problems when fertilizers leach into the water creating an imbalance of biological organisms and a subsequent depletion of oxygen. Plants and animals die and residues pile up. Pesticides and poisons, engine emissions from motorboats, and sewage effluent all threaten the Swartvlei’s habitat and its natural inhabitants – from micro-organisms to sand prawns, snails, sea-horses, crabs, fish, birds and indigenous plants. 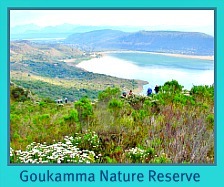 Greed, ignorance, apathy and negligence are compromising this exquisite environment of the Garden Route Lakes. 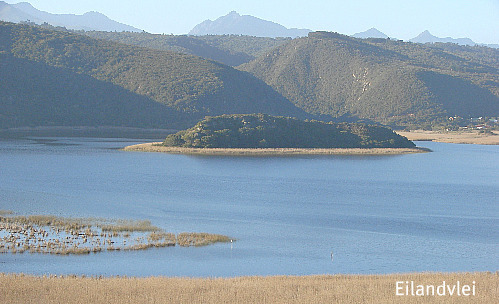 Of the Garden Route Lakes, Rondevlei and Langvlei, listed as Ramsar sites, are least disrupted by human presence. 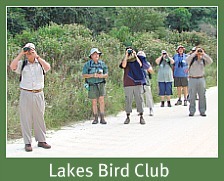 They are a birder’s delight. Specially erected hides give you an excellent opportunity to watch a wonderful array of bird life with minimal disturbance to them. Regular visits will almost always reveal some new encounter as your eyes get adjusted to the environment around the hide. To begin with, you see only the obvious. Later you start to notice the more secretive African Rail with his long red bill and oversized red feet and the sleek Black Crake with red legs and fat yellow beak. Some times several Fish Eagles are present, their haunting cry drawing your attention. On other occasions you may see as many as 5 African Snipe. The waders are always a pleasure and the hours simply fly by. Take your camera with you whenever you visit one of the Garden Route Lakes you never know what photographic opportunity could present itself! 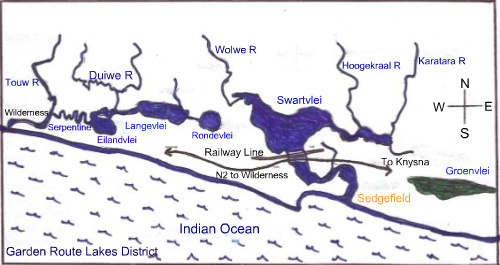 A narrow channel links Rondevlei to Langvlei and another narrow channel links Langvlei to Eilandvlei which receives its most significant water from the Duiwe River. 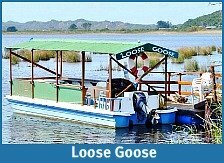 Eilandvlei is a very popular receation area of the Garden Route Lakes. Many activities take place in its environs. It has a yacht club and a caravan park along it's banks. Swimming competitions and a Float Fundraising competition are held there annually. Eilandvlei is connected to the Touw River by the Serpentine. This is a 5km long snakelike watercourse through a dense reed bed, which flows into the Touw River that then enters the Indian Ocean at Wilderness. Wilderness gets its water from the Touw River. Farm land irrigation, forestry plantations and alien trees in its catchment area make demands on the Touw so that, its’ mouth closes during periods of low rainfall. This pushes back fresh water towards the connecting lakes making them vulnerable to the quality of water they are receiving from the river. They have however adapted to receiving saline water when the mouth is open. Riverside residents insist the Touw’s mouth be artificially breached when they fear heavy rains will cause it to come down in flood overrunning their properties. Again, this action prevents effective scouring and deepening of the riverbed. Eilandvlei of the Garden Routes Lakes, is vulnerable to pollution, degradation and deprivation because of its dependence upon the Touw River which has so many other challenges to face. Exquisite as these lakes appear, currently, there are many concerns for this wetland paradise. 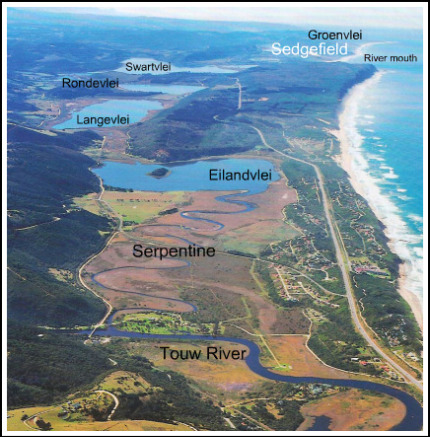 In the face of human development and the heavy demands on this Garden Route Lakes wetland system, it is hoped that the newly formed Garden Route National Park will be able to influence future decisions on behalf of our natural habitat. Until recent times, no attempt was made to place a monetary value on the contribution the environment makes to our lives. Now, at the 11th hour we are becoming aware that there are limits to earth’s finite resources. To preserve this vulnerable and important Garden Route lakes eco-system is undeniably to the advantage of all its beneficiaries. To do this, it is necessary to improve existing practices to cope with accelerating water crises and the effects of climate change. 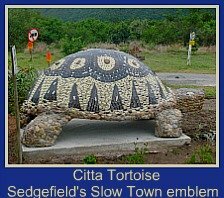 Susan Swain of Biowise has put together a proposal for a Biomimicry campaign for the Knysna Municipality (and Sedgefield falls under Knysna) which has been accepted and is about to be undertaken so it looks like we can look forward to some innovative concepts being introduced to our magical part of the world. Imagine the Garden Route Lakes pristine and environmentally sound, allowing all the diverse fauna and flora in them to be healthy and thrive. Like I have said before, we are genetically designed to find (good) solutions to our all planetary problems. I live in hope that we will find the will to implement them.